The original Pac Man is a bona fide classic, a stunningly simple yet wonderfully addictive arcade game which introduced the world to the little yellow pill munching blob. He's gone on to be one of the most enduring video game icons in history and still pumps out games today which rake in the billions. In the wake of his original success, any number of clones and copies flooded the market, like Pac Gal and Pac-Maine, most of which didn't offer much in the way of anything new and simply felt like watered down rip offs. PickMan 3D is a copy of the later Pacmania, which added three dimensions into the mix, and while it's a perfectly serviceable clone, it's always difficult to recommend these over the original. 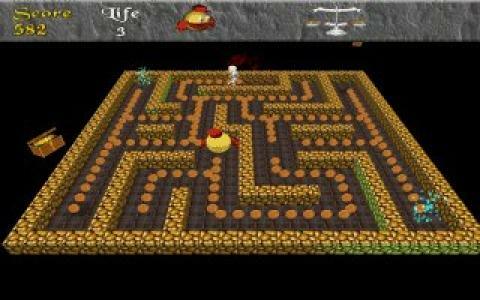 Here, Pac's maze running, pill munching antics remain essentially the same, but twist it so that the mazes are viewed from a slightly different perspective, which in theory ups the gameplay stakes a little. However, unlike its inspiration, this one still features static mazes rather than ones which scroll, which actually makes the transition feel less than ground breaking and which again makes this hard to really recommend. If you're looking for another Pac clone to add to your collection, then this is obviously a must play, and in truth it plays a decent game. All the essential elements are there, including the tight controls, accessible interface and fast-paced addictive gameplay, with visuals that aren't stunning, but which do the job. However, it's the lack of personality which hurts this the most, so really you're better off with the original.